Kit Spotlight- School Is Cool! Well it’s about that time! Time to start the designer spotlight back up! ScrappyCocoa here, and I have really been missing out on some great Gingerscraps products! Well, I did have a baby- one month ago- so I have been busy, but I am ready to get back in the action! One thing I love about this time time of year is the back to school frenzy. I’m not in school, nor do I have school age children, but when I was a school girl I LOVED back to school season. The new supplies, new teachers, seeing friends again and best of all the new clothes! Kathy Winters Designs has this adorable school kit to scrap all those Back To School memories. 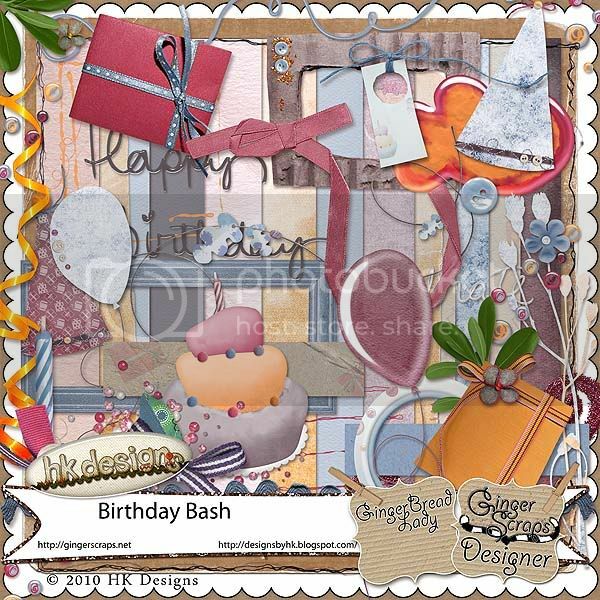 Here is a look at the adorable papers in this kit -16 of them! 1) The School Is Cool kit came from a request from a fellow scrapper. She’s a teacher and she was looking for a kit to use with some school photos and class projects with the kids. 2) When I sit down to design a kit, I already have a color palette chosen and a general idea of what I want to include to match the theme of the kit. I generally make my papers first because they take the least amount of time. I then move on to the elements because I sometimes struggle with what I want to include and I don’t like to use the same kinds of elements over and over again. I try to keep each kit looking fresh. 3) My scrap zone always includes a little Smooth Jazz on my MP3 player and a Yorkie and Doxie sitting under my desk. I work until they can’t stand it anymore and then I take a break, clear my head, and take them outside for a little play time. Sometimes, it’s just what I need to inspire me to spend a few more hours at the computer. Here is the kit entirely- Isn’t it fabulous? I love the owl, chalk board, school bus, and word tickets. This kit is adorable! Aren’t those great? Now, I couldn’t leave you without a little something, something could I? I made adorable little back to school boxes for my nieces and filled them with candy. I promise they were way cute… unfortunately my husband gave the boxes away before I had the chance to take pictures! Sad! We are in the middle of moving, else I’d print another one! Too bad the printer is boxed away! ANYWAY~ I made a little hybrid printable for ya’ll! Hope you enjoy and make sure you check out this kit in the GS Shoppe! Please note that the outline is on a separate layer and there just for reference of where to fold! Then you tuck the top flaps around each other in a counter-clockwise direction. Tie a ribbon and viola! Cute little box! Challenge Spotlight – Your Favorite! Good day to you all. I got to work at our fair this morning so I’m rather late getting around to this, but here I am! Nothing can keep me away! Lets find out who won last weeks challenge spotlight. *drum roll* and the lucky number is 3! That’s ktkadoo with her Family ’01 LO! Yay! You win my Mommy/Daddy overlays. 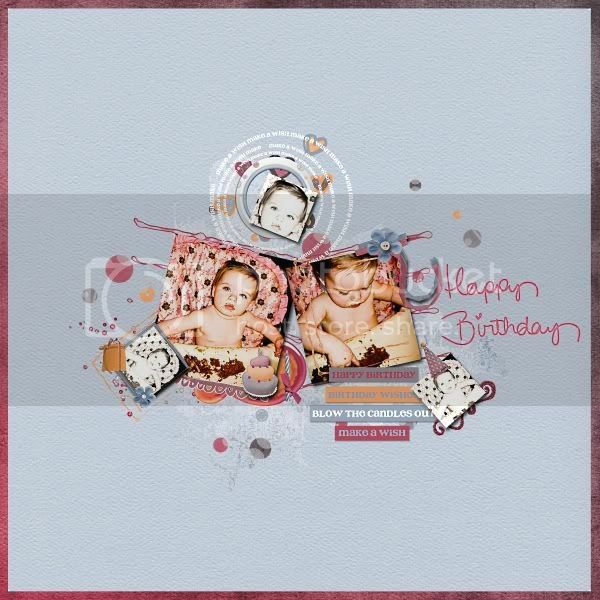 Currently my favorite challenge is the paper to digi Scraplift challenge. This is my current fave because I am having inspiration issues but these great paper layouts are great for giving me layout ideas! Now what’s your favorite Gingerscrap Challenge? This week dricamendes ran away with the LOTW votes. 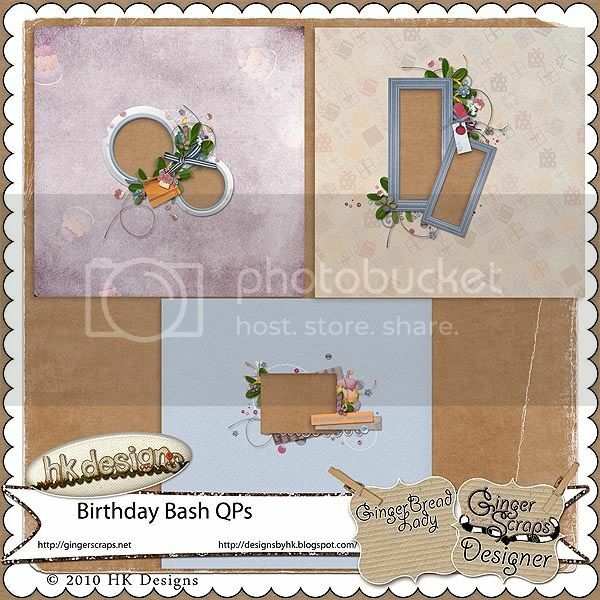 She did an amazing job creating a fun and inspiring layout! Happy Friday Everyone! Shannon here bringing you our New Release Friday Newsletter! How was your week? Hopefully it was a good one. Do you have big plans for the weekend? We do! Our county fair is this weekend. I love the fair! Walking around looking at all the homemade crafts, watching the animals, and eating all the delicious food! Now to make sure we remember the camera. Our designers have had a busy week here at Ginger Scraps. I’m so excited to show you what they have been working on! Don’t forget that everything is 25% off for this weekend! Plus if you spend $10 you get the monthly store collab Shabby Seashore for just $1!! This is one deal you don’t want to miss out on! Marshmella Designs has made “Seeds of Tomorrow“. The end of summer is coming and I know I will have a lot of gardening to do. I love spending time outside digging in the dirt and will really miss it when winter comes. So I thought I would do one more summer kit before fall is here. All 60 elements in Seeds of Tomorrow are hand drawn by me. I created all neutral papers so the elements really stand out in this kit. I hope you will enjoy it as much as I did creating it. This kit includes 12 papers and 60 elements and of course it will be 25% off for a week. You can grab it for $3.75!! Do you have a little crime fighter? A cops and robbers playing kid? 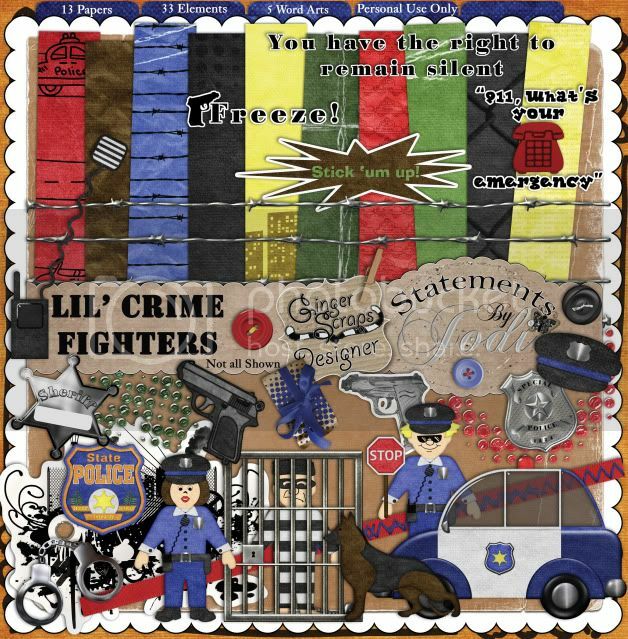 Then this kit “Lil’ Crime Fighters” by Statements of Jodi is perfect for you! 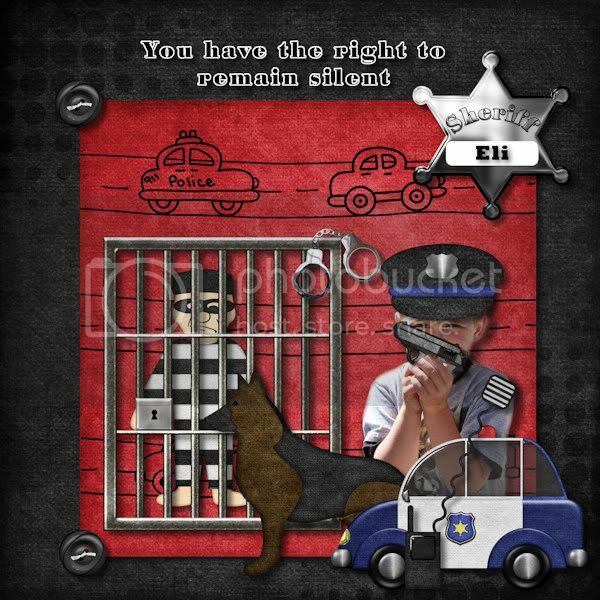 This kit has so many cute elements you will not have any trouble making the perfect layout for your little crime fighter! This kit includes 13 papers, 33 elements, and 5 word arts. barbed wire, guns, badges, police cars, police officers, police dog, handcuffs, buttons, ribbons, and much more! You can get it this weekend for only $3.75! Mommy’s Helper by Pretty in Green – As Moms it’s nice to get help around the house, because we all know how it can sneak up on us. 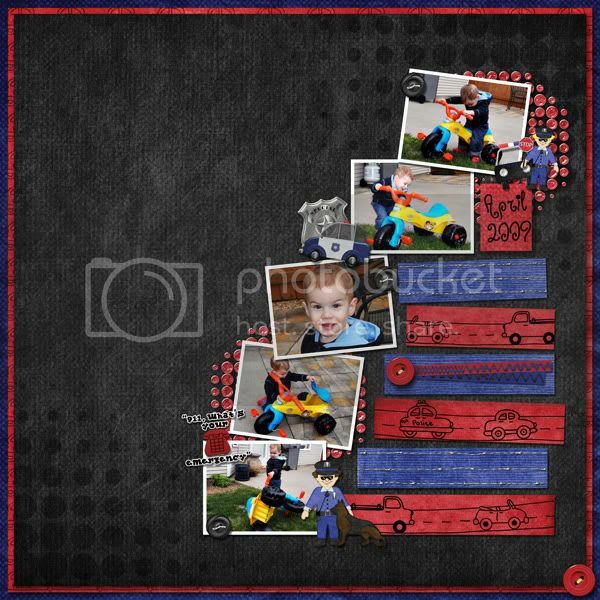 This kit is great for scrapping photos or journaling memories of your little helper helping you out, or maybe just making the mess worse, lol. 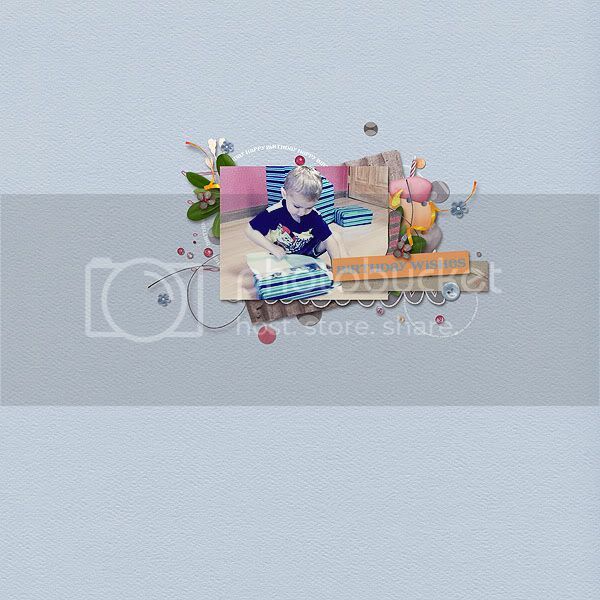 This kit is full of beautiful sorbet like colors perfect for just about any layout of your little man or lady. I just love the cleaning little dust bunnies in this kit! 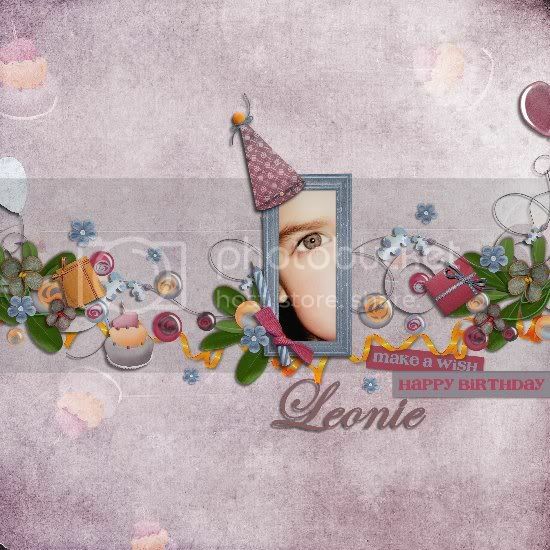 if you like this kit also look for the Bundle pack with added Papers and Word Art. 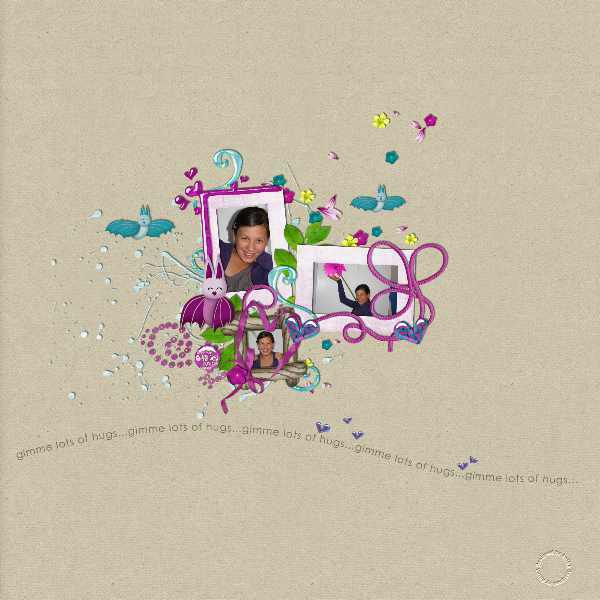 This kit contains 26 colorful rich textured papers and 50 coordinating elements. List Price $5 but if it is on sale for only $3 this weekend! Faded paper pack – Add on List Price $3 but is only $2.25 this weekend. This Bundled kit contains 26 colorful rich textured papers and 50 coordinating elements. Added Faded papers and coordinating Word Art tags in 2 colors. It is on sale for only $8! What a great deal!! $5.00 regular price and on sale for $3.00!! 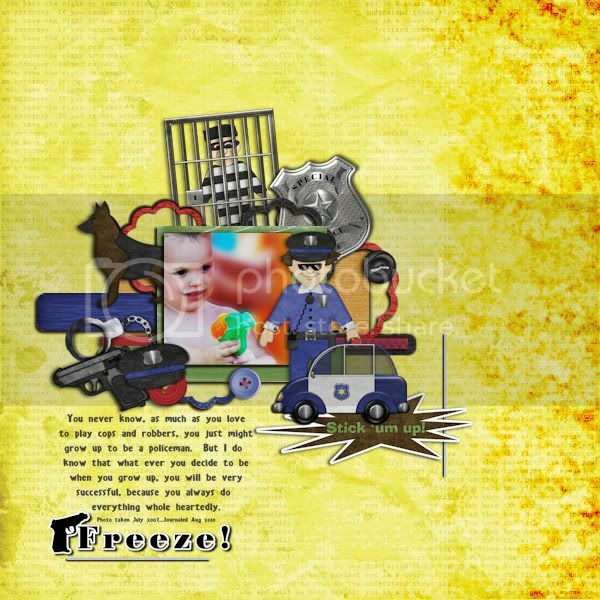 This is a set of 3 quick pages all 12 x 12 , 300 dpi., png images designed by HK Designs. Super easy to use, just pop your photos in and you can be done! Or for a more personal touch add some journaling or an alpha. The possibilities are endless!! The regular price $3.00 but is on sale for $2.00!! Pretty in Green is also offering a sale to celebrate Ana’s 2nd birthday! All of her Puppy Love packs will be $2! Hurry the sale ends Aug. 31st! What is better then that! You may have noticed… the forum and gallery are down. Well at the moment they are.. hopefully it will be back up before I wake up in the morning! The issue is… we have gotten too big for our britches. GingerScraps is growing like crazy! Which is super exciting- only downside- my shared server is having trouble keeping up. I knew this day was coming… time for our own dedicated server!! The site should be restored soon and then we will upgrade to a dedicated server- but I will not be changing hosts- just upgrading, which they have told me “goes almost seamlessly” so fingers crossed for that! Thank for your patients and understanding! Really? we’re already coming to the end of the month? Worse still the end of summer? I suppose it must be done. As does the the monthly challenges! Hurry and get those done! Remember the more challenges you do, the more points you get and bigger the discount you can earn for the Gingerscraps store! On to this weeks Challenge Spotlight, Julie’s August Technique Time! Remember, every month Julie posts a challenge encouraging you to use the newest or most popular technique in scrapbooking that she can find. This month the technique is a cluster..not just any cluster, but a photo and element cluster all in the middle of your page. Here’s some other great examples from some ladies that have already done this challenge this month. I love clusters! Don’t you? You should try this out at the Aug. Technique Time! Then come back here and post the link to your LO in the gallery and post it in a comment here. Next week I’ll randomly select one and that person will win a prize from ME! (Harmonystar). CT & those who have already done the challenge are elligable. Let me see those comments! Here are Julie’s kids first day back… all smiles!! Julie has 2 kids in High School! And Tyler started Kindergarten…with a few tears He just wants to stay home with Mommy and Daddy and Travis and play. Yay Tyler!!! I’m sure you’re going to love it!! I’m not sure how it is for everyone else but I have to say I had a really hard time when my kids started school…. they grow up so fast!!! Anna may not be going to school this year but she also had a big change in her life! oh and she told me about how she almost lost these pics and a few others but her Sister in law was able to retrive them off her card, thank goodness, these pics are to cute! once you stayed in bed all night sleeping sound. to fast, your my baby! SO have your kids hit any milestones lately?? My youngest is in grade 7 this year… so no more elementary school for us anymore… 🙁 Kinda makes me sad!! Good Morning! We had a very exciting LOTW poll this week. It was a close vote, but this weeks winner is scrappinbella. She squeaked out a win with her beautiful floral creation! Congrats to her! Check out her Gingerscraps gallery and leave her some love. 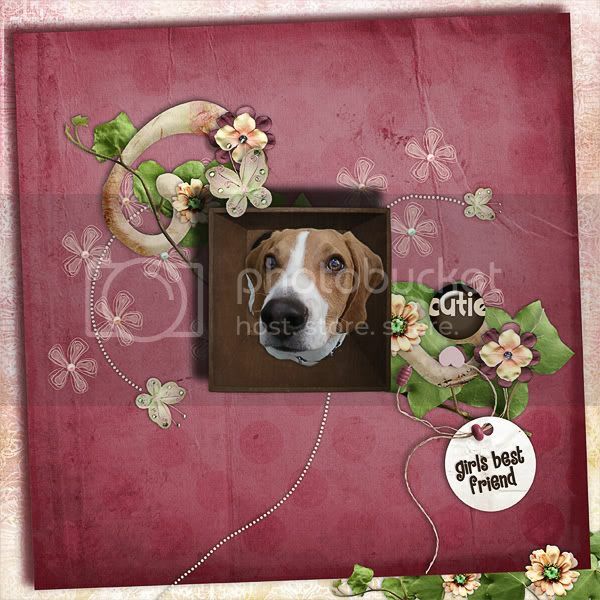 This LO was created using Mandymade’s Make it Pretty kit. Find it here. Don’t forget to head over the the forum to vote for the next LOTW winner. Remember, you can be a LOTW winner too. All you have to do is scrap! Happy Scrapping.